What is 3 Gun you may ask. Click the button below to help understand. 3 Gun Rules are at the bottom of the page. If you would like to request a copy emailed please send a request to Corey or Shawn at lakeland3gun@gmail.com or Adam at clfgmembers@gmail.com. October 19 “Head to Head Shoot Off"
Dates may change due to weather, unseen circumstances or range conditions. Please check on facebook as well as website. Welcome to Lakeland 3 Gun Group. 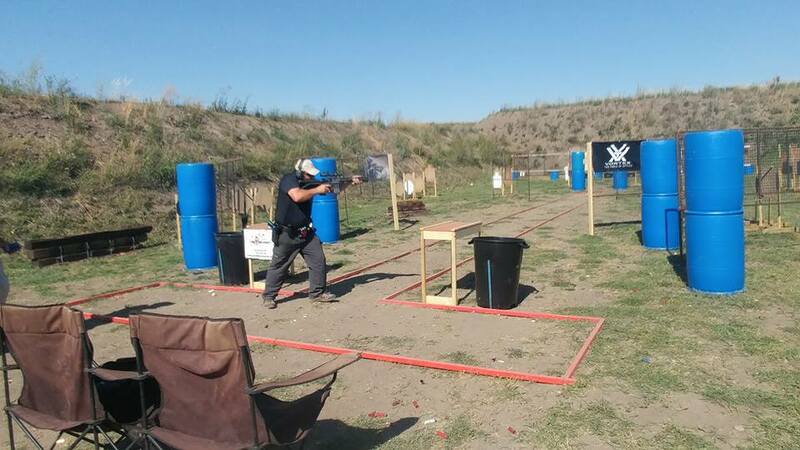 We currently shoot at Cold Lake Fish and Game (CLF&G) and Bonnyville Shooting Sports Association (BSSA). 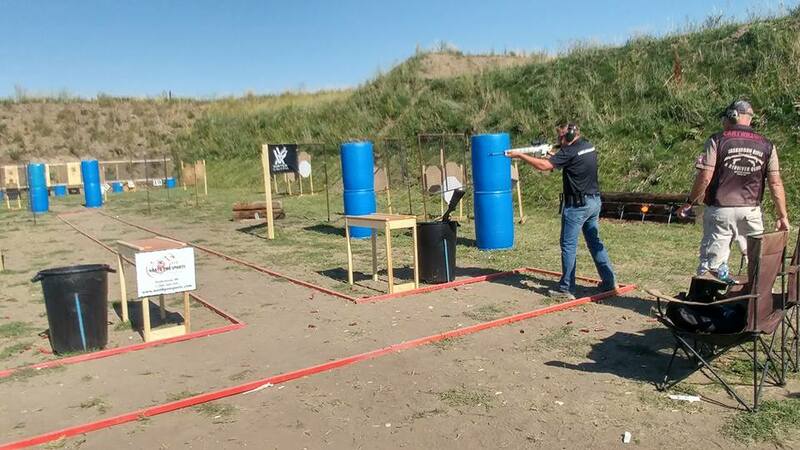 Lakeland 3 Gun currently does not employ any separate divisions for competitors. 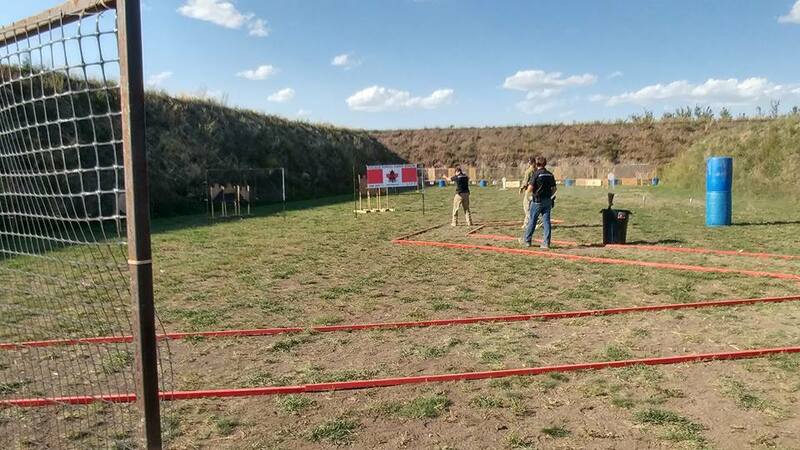 If your firearms and gear are Canada legal, you can run it at our 3 Gun events. As we get bigger we will consider appropriate divisions in the future. Firearms: There are no exceptions to this at this time. Pistol. Semi-automatic, magazine fed in 9mm or larger. Rifle. Semi-automatic, magazine fed in .223 Remington or 5.56 NATO only, and; Shotgun. Semi-automatic or pump-action in 12 or 20 gauge only. NOTE 1: At this time there is no provision for firearms outside of the above list. Possibly in the future, as our numbers grow and a demand for other firearms becomes apparent, we will consider this. NOTE 2: The maximum number of shot shells that can be loaded into the shotgun at the stage start is EIGHT (8). After the start beep, a competitor can immediately load more shells if the shotgun can legally hold them and continue on with the stage. A competitor can reload as many shells as he wishes to (legally) throughout a stage. 1.1.1 Endangering any person, including yourself. This includes sweeping one’s self or anyone else with a loaded or unloaded firearm. Sweeping is defined as allowing the muzzle of the firearm (loaded or unloaded) to cross or cover any portion of a person. 1.1.1.1.1 Exception: Some body types combined with some holster types makes it almost impossible to holster a firearm or remove the firearm from the holster without sweeping a portion of the shooter’s lower extremities. Thus, a match disqualification is not applicable for sweeping of the shooter’s own body below the belt while removing the firearm from the holster of holstering of the firearm, provided that the shooter’s trigger finger is clearly outside of the trigger guard. However, once the muzzle of the firearm is clear of the holster on the draw, sweeping any part of the body is a Disqualification. 1.1.1.1.2 No shoulder holsters or chest mounted holster will be allowed to prevent or reduce accidental sweeping. 1.1.3.2 Striking the ground beside the shooter. 1.1.3.3 Into the ground downrange closer to the shooter than two meters, unless engaging a low target that is within two meters. 1.1.3.5 During a Load and Make Ready, Unload and Show Clear, Reload, or Malfunction Clearance. 1.1.3.6 Before the start signal. 1.1.3.7 While transferring a firearm from one hand to the other. 1.1.4.1 With verbal instruction from a Safety Officer. 1.1.4.2 While engaging targets in a CoF under direct supervision and visual contact of a Safety Officer. 1.1.4.3 When in a designated “Safe Area”. 1.1.5 Pointing the muzzle over the berm during the “Pull The Trigger” portion of Unload and Show Clear. 1.1.6 Drawing a firearm while facing up range. 1.2.1 Dropping a loaded or unloaded firearm during a Load and Make Ready, the shooting of a string or stage, reloads or malfunction clearance or during Unload and Show Clear will result in Disqualification from match. IF a shooter drops a firearm the SO will immediately give the command “Stop”. The SO will pick up/recover the dropped firearm and render it safe and unloaded before returning it to the shooter. The shooter will be disqualified from the entire match. 1.2.2 If a competitor drops a loaded or unloaded firearm within a stage boundary it is a Disqualification from the match. 1.2.3 Dropping an unloaded firearm or causing it to fall while outside of stage boundaries is not a disqualification. 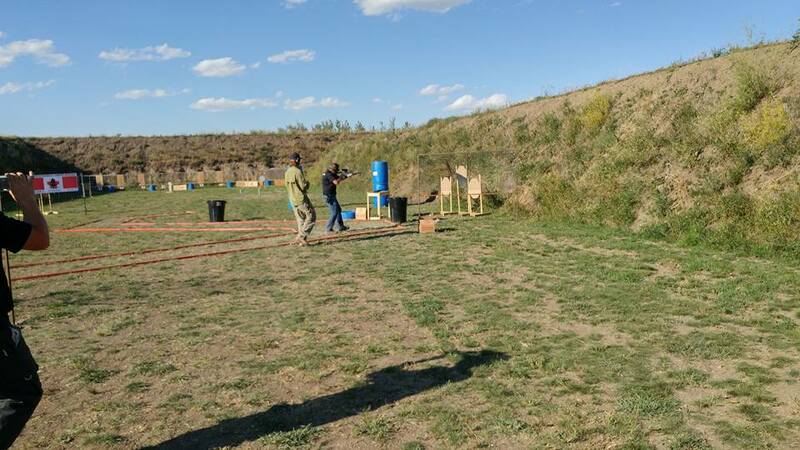 1.3.1 Eye and Ear protection is required to be used by everyone attending the 3-Gun shooting event. The responsibility for safe and serviceable ear and eye protection falls completely on the shooter or spectator. 1.4 Firearms used in events will be serviceable and safe. The responsibility for safe and serviceable equipment falls completely on the shooter. 1.5 The trigger finger must be obviously and visibly outside the trigger guard during loading, unloading, drawing, holstering, while moving (unless engaging targets) or during malfunction clearance. 1.5.1 First offense is a Procedural Error warning. Second Offence is a DQ from the match. 1.6 The normal condition of firearms not in use during a Course of Fire (CoF) will be dictated by the RO at the beginning of the stage. Firearms may be staged empty or loaded and on safe depending on the stage design. The shooter’s firearm can be loaded or unloaded only under the direction of the RO. 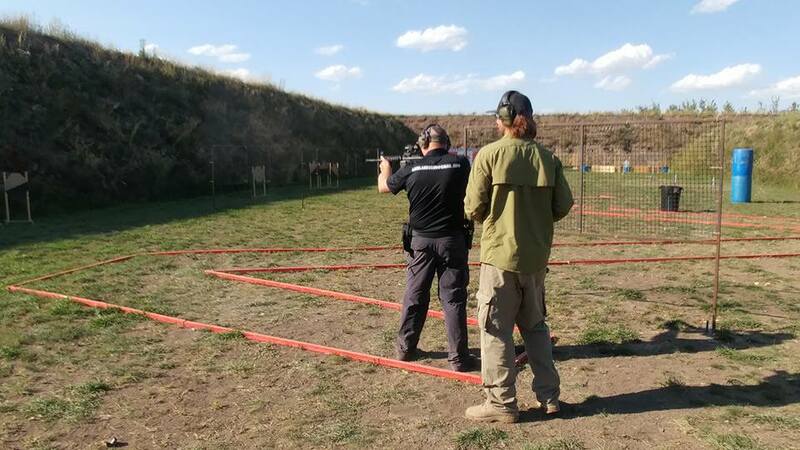 1.8.1 If the shooter’s firearm points further up range than 90˚ from facing downrange (180˚ laterally) the shooter will be Disqualified from the event. If a shooters firearm is approaching 90 the RO will yell “muzzle” to prevent passing 90. 1.9.1 Each Safe Area is clearly identified. 1.9.2 Unloaded firearms may be handled at any time. This area is used for bagging or un- bagging a firearm, holstering, drawing, dry firing, or equipment adjustment. 1.9.3 A Safe Area may also be used for inspections, stripping, cleaning, repairs and maintenance of a firearm or related equipment or parts. 1.9.4 In all cases the muzzle of the firearm must be pointed in a safe direction. 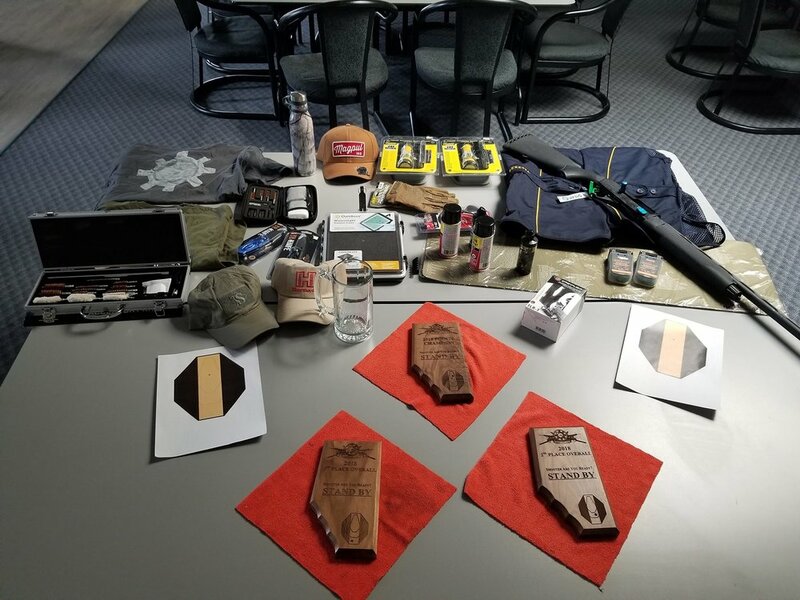 1.9.5 Handling of ammunition, loaded ammunition carriers, loose rounds, dummy ammunition, snap caps, simunitions, training rounds, or loaded firearms is not permitted. 1.9.6 A Safe Area may also be used, while accompanied by a SO to render safe a firearm that has locked up and contains a live round or rounds. 1.9.7 Reload practice within the Safe Area is not allowed. “Range is Hot, Eyes and Ears”. This is the first command given to the shooter starting the action of shooting a stage. This command signifies the start of the COF. The shooter will make sure that their eye and hearing protection is in place. It is also notification to anyone in the shooting bay to check their own eye and hearing protection is properly fitted. 1.10.1 “Load and Make Ready”. When the shooter has proper eye and hearing protection, RO will issue the “Load and Make Ready” command. The shooter will prepare the firearm and magazines to match the start position for the stage. 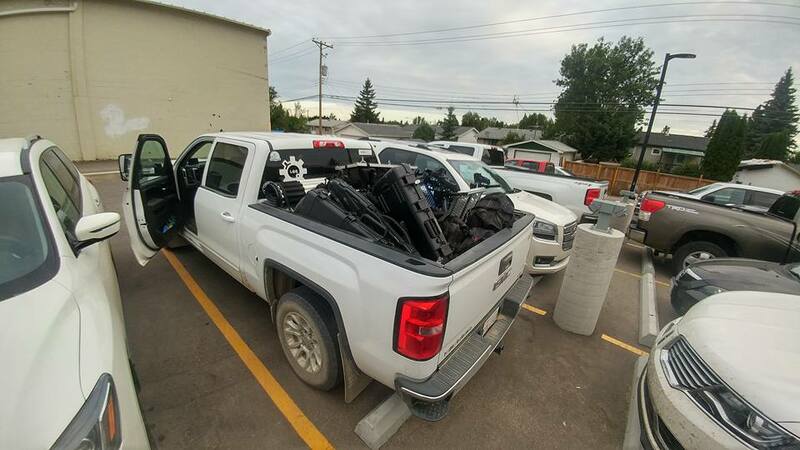 Typically this is to load the firearm and holster, but may include non- typical loading or staging of equipment. The shooter will then assume the starting position necessary for the stage. 1.10.2.1 After “Load and Make Ready” the SO will ask the shooter “Are You Ready?” If ready, the shooter should respond verbally, or by obvious nodding of the head, but may also choose to stand ready. If there is no response from the shooter in approximately (3) seconds the shooter is assumed to be ready. 1.10.2.2 If the shooter is not ready when this question is asked, the shooter must respond “Not Ready”. If the shooter continues to not be ready, the shooter must take a step out of the shooting position. When ready the shooter assumes the starting position the “Are You Ready” question will be asked again. 1.10.2.3 The shooter is expected to be ready to proceed approximately (15) seconds after the “Load And Make Ready” command. If the shooter is ill prepared and needs more than (15) seconds to get ready, the shooter will be advised that he/she is being given approximately (15) seconds more to prepare. If the shooter is still not ready after that period, he may earn a (10) second Procedural Error penalty and will be moved down in the shooting order. 1.10.3 “Standby”. This command is given after the shooter is ready. This command will be followed by the start signal within one (1) to four (4) seconds. The shooter may not move or change positions between the “Standby” command and the start signal, unless required to do so by the CoF. 1.10.4 “Finger” This command is given when the shooter’s finger is not obviously and visibly outside the trigger guard when it should be as noted above. 1.10.5 “Muzzle” This command is given when the muzzle of the shooter’s firearm is exceeding the 90˚ rule. The shooter must correct the errant muzzle and continue with the stage. See 90˚ rule above. 1.10.6 “Stop”. This command is given when something unsafe has happened or is about to happen during a stage, or when something in the stage is not correct. The shooter must immediately stop all movement. Place the trigger finger obviously and visibly outside the trigger guard, and await further instruction. Failure to immediately stop and remove the trigger finger from within the trigger guard will result in Disqualification from the match. 1.10.7 “If Finished, Unload and Show Clear”. This command will be issued when the shooter has apparently finished shooting the stage. If the shooter is finished, all ammunition will be removed from the firearm and a clear chamber/cylinder will be shown to the RO. If the shooter is not finished, the shooter should finish the stage and the command will be repeated. 1.10.8 “If Clear, Hammer Down and Holster”. Once the RO has inspected the chamber/cylinder and is found to be clear, this command will be issued and the shooter will comply. The muzzle must be pointed down range and towards a berm. Hammer down indicates pulling the trigger to ensure a full decock. If the firearm discharges, the shooter will be disqualified. 1.10.10 The shooter will then move to any other firearms that have been “dumped” along the stage and clear them in front of the RO. 1.10.11 “Range is Clear”. This command indicates to the shooter and anyone within the stage boundaries that the range is clear. This command begins the scoring and resetting of the stage. 1.11 The RO will stop a shooter that has started a CoF and is not wearing proper eye or ear protection, and a reshoot will be given to the shooter. If the shooter’s eye or hearing protection becomes dislodged during a CoF, the same action applies. If the shooter discovers missing or dislodged eye or hearing protection before the RO and stops, the shooter will also be given a reshoot. A shooter who intentionally loses or dislodges eye and /or ear protection during a CoF will be disqualified. 1.12 Steel targets must be engaged from ten yards (9.1 meters) or more. 2.1 Prior to shooting a stage, a group walkthrough will be given by the RO. 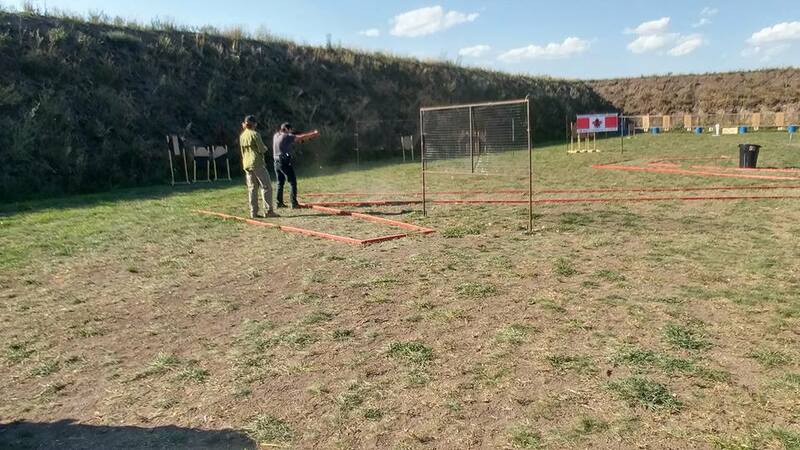 During the group walkthrough, the shooter will be allowed to view each target from every shooting position. This includes taking a knee or prone position. Other than the group walkthrough, no individual stage walkthroughs are permitted. Individual walkthroughs include walking the path of fire or assuming shooting positions to check positions or target engagement order, etc. 2.1.1 Only the squad (people shooting that particular stage at that time) will be allowed in the shooting bay. If your squad is finished its last stage and you are waiting to shoot the next stage, you are not permitted into that shooting bay until the current squad is finished and stage has be reset and patched. 2.2 Air gunning is permitted. Air gunning is the act of going through the motions of firing all or portions of the stage with a hand or pointed finger while within the stage boundaries. There will be absolutely no firearm handling during a walk through. 2.3 All targets in the CoF are to be attempted. A shooter may forget or miss a target and will be assessed a penalty for missing a target. If it is found that a shooter is “gaming the stage” by purposefully not engaging targets because he believes that it will be faster or the penalty for skipping the target will be less than then the time to engage it, the shooter will receive a (25) second “unsportsmanlike penalty”. 2.3.1 Cardboard/Paper targets are to be engaged with two shots per target with the goal of two hits anywhere on the target. 2.3.2 Steel (non-falling) targets require a minimum of 1 hit on target before completion of the stage. The “hit” will be called by the RO. 2.3.3 Steel (falling) targets must be engaged until the target falls. In the event the target has been hit twice and the target fails to drop, the target will be considered successfully engaged and the shooter can proceed to the next target engagement. 2.3.4 Clays (or destructive targets) must be engaged until the target shows evidence of being hit. 2.4.1 Slide Lock, when the firearm is empty and the slide/bolt locks to rear of the action. 2.4.2 Loaded, a shooter may reload or top up a firearm anytime within the stage providing it is safe to do so and the stage design allows for it. 2.5 All reloads must be conducted with the muzzle pointed in a safe direction and finger off the trigger. 2.6 At no time is it permissible to fire while holding a magazine, or loose ammunition while reloading or preparing to reload. A shooter may hold the magazine of a rifle that is inserted into the magazine well while firing. 2.7 Shooters are discouraged from picking up dropped magazines or loose shells off the ground. However, shooters may pick them up as long as he maintains his muzzle in a safe direction. Unsafe firearm handling while picking up a magazine or shells is subject to warning or disqualification. 2.8 No shooter can reshoot a stage or string for firearm for “mental” malfunctions. Reshoots may be required for stage equipment malfunctions. 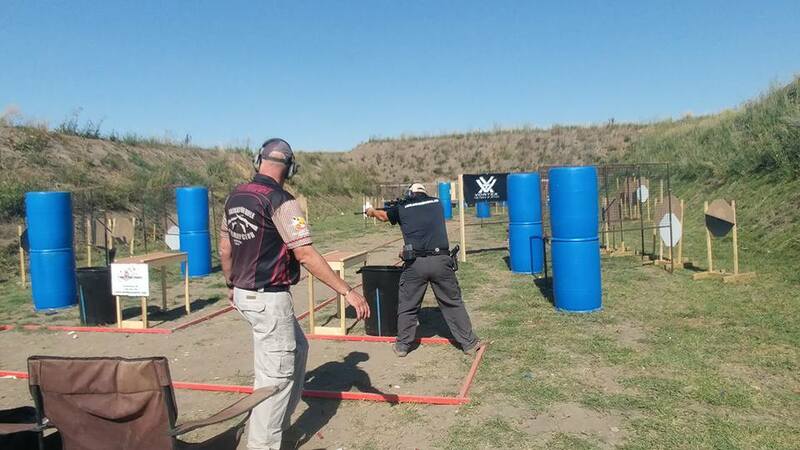 If an RO feels he has interfered with a shooter, he will offer a reshoot to the shooter immediately following the holster command and prior to the scoring of targets, as determined by the RO. 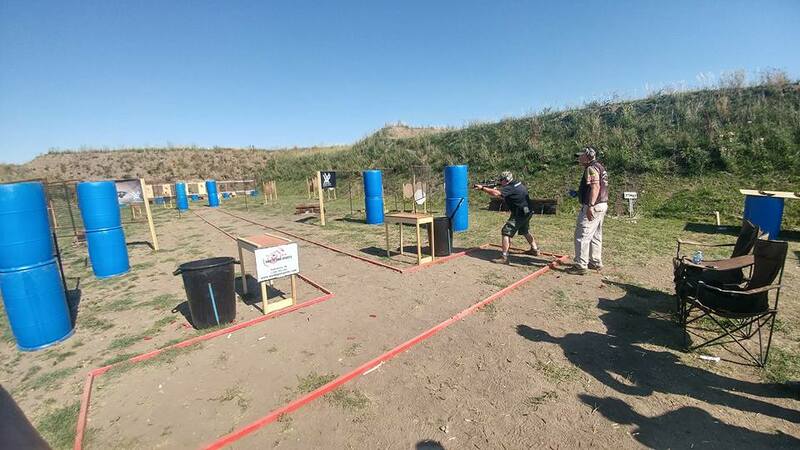 If a shooter feels he has been interfered with by an RO, the shooter must request a reshoot immediately following the holster command and prior to the scoring of targets. The MD (Match Director) will determine if a reshoot request is granted. 2.9.1 I will follow all the safety rules of Lakeland 3-Gun and the host Range. The safety of the shooters, match officials, and bystanders shall always be my primary objective. 2.9.2 Prior to and during a match, I will refrain from the use of alcohol, substances, or medications that may negatively impact my ability to shoot safely. 2.9.3 I will attempt to maintain a positive attitude with squad mates and staff. 2.9.4 I recognize that it is my responsibility to maintain a working knowledge of the current Lakeland 3 Gun rulebook and, acknowledge that not knowing the rules is not an excuse for a reshoot. 2.9.5 I will respect the RO and staff and be a good sportsman. 2.9.6 I will listen carefully and refrain from talking during shooters’ briefings and stage briefings. 2.9.7 I understand it is my responsibility to be ready to shoot when called to the line. 2.9.8 I understand it is my duty to help reset stages between shooters unless I am the current shooter, the on-deck shooter or have just finished shooting, unless instructed otherwise by an RO. 2.9.9 I will not communicate with others in a threatening, harassing, or abusive manner. 2.9.10 It is my responsibility to check my match scores within the verification period to see that they are correct. This before I leave the stage. I acknowledge that once I leave the stage my scores are permanent. This also includes appealing to the MD for unsportsmanlike penalties. A shooter must make it known to the RO and MD that he is appealing the penalty before moving on to shoot the next stage. If the shooter does not, the penalty will stand. If the shooter is DQ’d, the MD must agree and action the DQ before the shooter leaves the stage. 2.9.11 I understand that violation of these responsibilities and code of conduct may result in my disqualification from a match. 3.1.1 The scoring system adopted for use in Lakeland 3 Gun is designed to reward a balance of accuracy with speed. 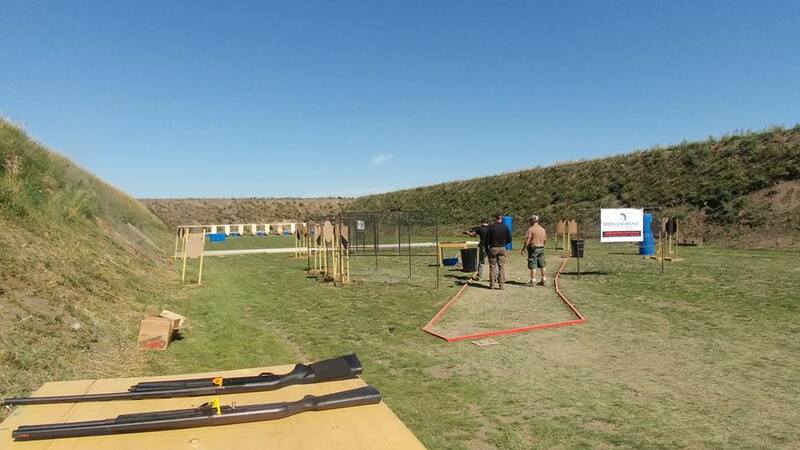 Lakeland 3 Gun scoring converts everything to a time score and the lowest time wins. The scoring system is also designed to be very simple to understand and use. 3.1.2 The main thing to remember when scoring in Lakeland 3 Gun is that everything is based on time, the raw time it takes to shoot a stage plus penalties. 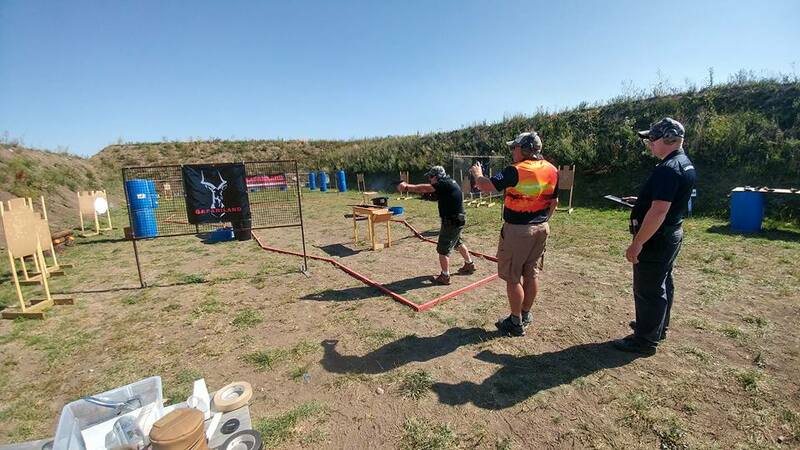 3.3.1 If a shooter has started a stage but cannot finish the stage due to a broken firearm, squib, or personal injury, the score will be determined by whichever of the following method results in the best score. 3.3.2 If the RO stopped the shooter for a perceived squib, and it turns out not to be a squib, the shooter will be given a reshoot. If the RO stopped the shooter for perceived squib, and it is a squib, the score will be determined by of the following methods. 3.3.2.1 All required shots that were not fired will be scored as misses and added to the time at which the shooter had the squib. 3.3.2.2 If a shooter cannot complete a stage because his firearm breaks, the shooter will be scored the same way as a squib as noted above. 3.4 Always award any reasonable question on scoring to the shooter. For example, if the hit is on the edge of the target, the hit will be given to the shooter. 3.5 Do not shoot props. 3.5.1 Black paint on the targets will identify “Hard Cover” or impenetrable barriers. Hits on “Hard Cover” will be counted as misses. If a shooter fires two shots at a target and one bullet strikes a hard cover, the shooter will be assessed a (10) second penalty, (5) seconds for hitting the “hard cover” and a second (5) second penalty for missing the target. If a shooter fires three times at a target and two bullets hit the target and one hits a “hard cover”, only one (5) second penalty will be assessed for hitting the “hard cover”. 3.5.2 White targets identify “No Shoots”. Hits on “No Shoots” will have a (5) second time penalty scored the same way as “hard cover” noted above. 3.6.1 Penalties for missing a target are (5) seconds per miss. 3.6.2 Unsportsmanlike penalty is (25) seconds. This penalty can be appealed to the Match Director by a shooter and must be resolved before the shooter moves to the next stage. Match Directors decision is final. 3.7 Reactive Targets Reactive targets must be engaged until activated, knocked down, or destroyed as required. 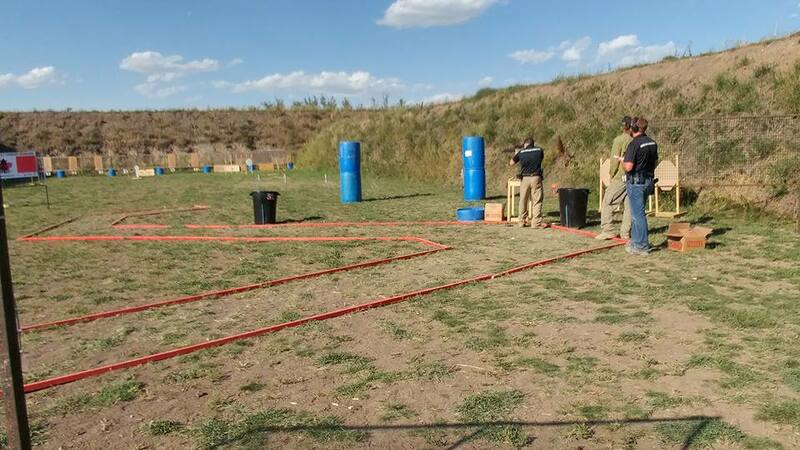 In the event that a reactive target is not responding after the third attempt with a solid hit, the shooter can move on to the next shooting position in the stage of fire or when the RO orders him/her to do so. The only exception to this rule is if the shooter is attempting to knock down steel with a short barreled, un-chocked shotgun. If the shooter hits the steel but does not knock it over/down, the shooter will either continue to engage or take the “miss” after attempting it. 4.1.1.1 A shooter fails to follow the procedures set forth in the stage description. 4.1.1.2 A shooter breaks a rule of the game such as engaging a target with the wrong firearm. 4.2 Unsportsmanlike adds (25) seconds to the total score and is assessed for use of inappropriate devices or unfair actions. Note: This is intended to be used solely as a penalty for deliberate attempts on the part of the shooter to circumvent or violate the competition rules to gain a competitive advantage. It should not be assessed for inadvertent shooter errors or in cases where it is obvious that the shooter gained no competitive advantage by their actions. In these cases, the shooter should be assessed a PE rather than an unsportsmanlike penalty. All unsportsmanlike penalties must be approved by the MD. 4.3.1 Unsafe firearm handling as defined in the Safety Rules Section. 4.3.2 Receiving more than one unsportsmanlike penalty during a single stage. 4.3.3 Unsportsmanlike conduct such as harassing or threatening behaviour. 4.4 All Disqualifications must be confirmed by the Match Director. NOTE: At any time before the start of a match, or during the match if you have a safety concern, please address it to the RO immediately. 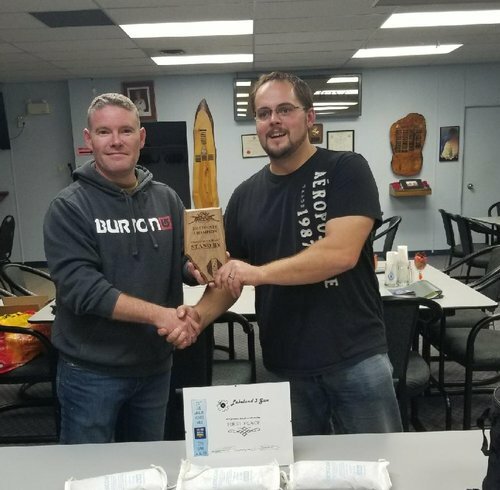 Disclaimer: Lakeland 3 Gun has compiled these rules from CHAS 3 Gun Club and Wild Rose Action Shooters and therefore credits these two organizations for the bulk of these rules. Lakeland 3 Gun has modified these rules to suit our club.